Is Walker planning to raid public employee pensions? A new study by the Pew Center on the States reports that Wisconsin public employee pension system is one of only two in the nation that is fully funded and that the state is a leader in managing its liabilities for both pension and health benefits over the long term. Given the health of the Wisconsin Retirement System (WRS), Eli Lehrer, vice president of the conservative Heartland Institute, advised Governor Walker to focus his budget balancing effort elsewhere. But Walker doesn't appear to be heeding Lehrer's sound advice. On page three of Walker's budget repair bill, there is language that mandates that a study of the existing WRS be performed and that it must “specifically address establishing a defined contribution plan as an option for WRS participating employees.” The mandate even includes a deadline for completing this study, June 30, 2012. So if the Wisconsin public employee pension fund is well managed and fully funded, why does Walker's budget repair bill include organizing a group to study it? Because as the notorious bank robber Willie Sutton said when asked why he robbed banks, that's where the money is. 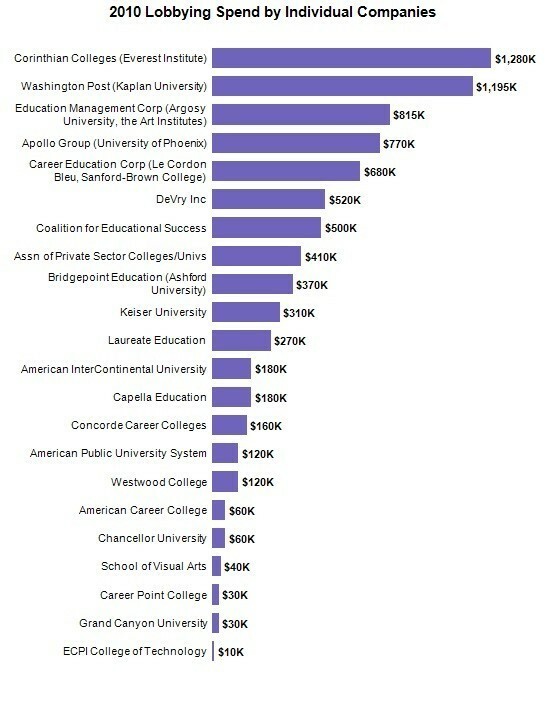 The for-profit higher education industry spent $8.1 million on lobbying activities in 2010, up from $3.3 million the year before, according to an analysis by The Huffington Post of data from the Center for Responsive Politics. Corinthian College which owns Everest College, the controversial tech school with among the nation's highest student loan default rates, led the way, spending $1.28 million on lobbying. Everest opened a branch in Milwaukee earlier this year despite the opposition of several Common Council members including the district's Alderwoman, Melele Coggs, the Hillside Neighborhood Association, the NAACP, AFT Local 212, Voces de la Frontera and several student organizations. The Huffington Post emphasized the sharp increase in such spending took place at the same time that the U.S. Department of Education is attempting to regulation for-profit colleges. But Harris Miller, president of the Association of Private Sector Colleges and Universities, said that the lobbying was "not unique in any sense," comparing it to "...Boeing or defense contractors using their money to promote an agenda, which is to win a contract of the U.S. government." Wisconsin Congressman Paul Ryan and other deficit hawks are using scare tactics to achieve the long held Republican goal of dismantling Medicare and Medicaid and other social programs. Social Security cannot be far behind. His budget bill would end the guarantee provided by Medicare and Medicaid to the elderly and the poor, which has been provided by the federal government with society’s clear assent since 1965. The elderly, in particular, would be cut adrift by Mr. Ryan. People now under 55 would be required to pay at least $6,400 more for health care when they qualified for Medicare, according to the Congressional Budget Office. cut food stamps by $127 billion, or 20 percent, over the next 10 years, increasing hunger among the poor. cut Pell grants for all 9.4 million student recipients next year, removing as many as one million of them from the program altogether. slash job-training programs for the unemployed desperate to learn new skills. Ryan's analysis that profligate spending on the poor and middle class is bankrupting America is a lie. Only a decade ago the United States was running a surplus projected to be $5.2 trillion over ten years. 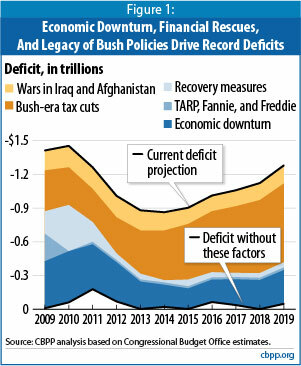 The current and projected deficits are largely the product of Bush era tax cuts (1.65 trillion that went mainly to the super rich) two wars ($1 trillion and counting) and the Great Recession which was caused by the Republican's manic pursuit of financial deregulation. See the graph and youtube video below for more details. Ryan supported every single one of these deficit driving policies making his concern over the deficit impossible to swallow. Ryan also proposes $2.9 trillion in tax cuts by lowering tax rates for the rich and corporations. People with incomes over $1 million would receive average tax cuts of $125,000. This is not a serious deficit reduction plan. It is a budget that accelerates the nation's redistribution of wealth and income, already at historic highs, to the haves by undermining the nation's social compact with its poor and working middle classes. U.S. House Oversight and Government Reform Chairman Darrell Issa convened a hearing today on the "tough choices" facing state governments. But instead of focusing on real solutions to state budget crunches, Issa invited Wisconsin Governor Scott Walker to tell members of Congress that attacking teachers, nurses, and other middle class workers is a good thing. The hearing was not the inside the beltway coming out party that Walker planned. Cleveland Ohio Congressman Dennis Kucinich and Milwaukee's Congresswoman Gwen Moore made sure of that by taking Walker to task for scapegoating Wisconsin's public employees and stripping them of their rights while cutting taxes for the rich and corporations while raising them on the working poor. 100 years after the deadly Triangle Shirtwaist factory fire in New York City that killed 146 mainly young Jewish and Italian immigrant women workers, a garment factory fire in Bangladesh killed 26 young female workers and injured almost 100. In both cases the exit doors were locked and many of the young women jumped to their deaths to avoid being burned to death. Just two years ago MATC hosted a National Labor Committee tour where three young female workers from Bangladesh discussed their 9 cent an hour pay making clothing for WalMart with a standing room only audience of MATC students. U.S. corporations have moved production abroad to countries like Bangladesh to escape unions and the labor and workplace regulations that brought democracy to the American workplace. As we remember the Triangle fire victims on the 100th anniversary of that terrible and avoidable fire, we must never forget that the inhumane conditions that caused their deaths continue to exist in garment factories in the developing world. The fight for workers' rights continues.